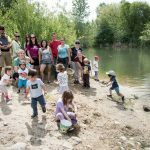 by Jenny Wisniewski – In the summertime, my young family regularly camped. I have always wanted my boys to get dirt beneath their nails, play from dawn to dark, and explore until they collapsed in their sleeping bags, bellies full of s’mores. 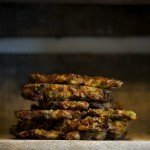 It was the packing of gear and meal planning that my husband and I dreaded. 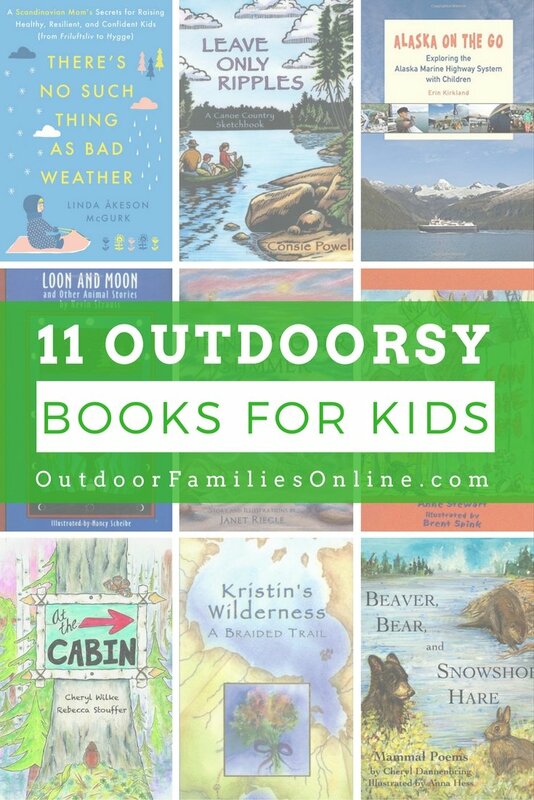 Our family camping trips had waned until this past August when Wilderness Inquiry (WI) reignited this lapsed family pleasure. WI provided the equipment, meals, and guides. We simply showed up. 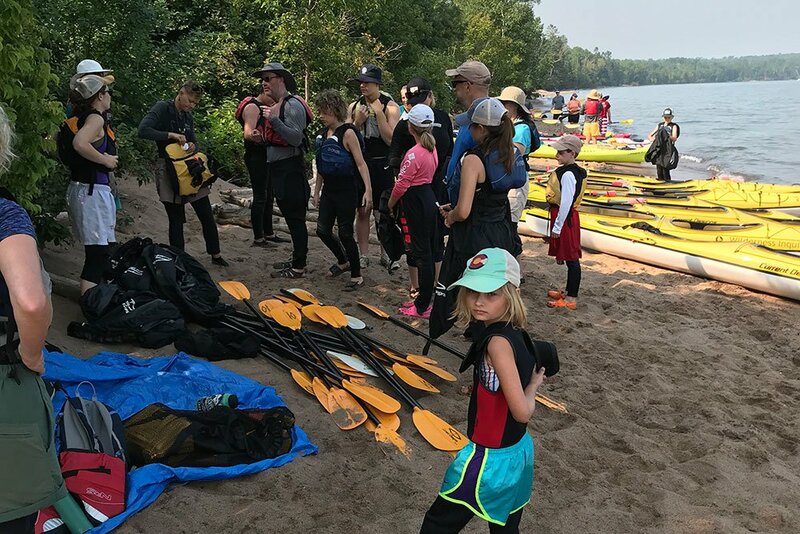 Thus began a long August weekend of family camping, hiking, and kayaking with four other families in Northern Wisconsin’s Apostle Islands. Minneapolis-based Wilderness Inquiry plans and leads a variety of adventure trips both domestically and internationally. 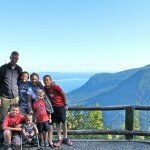 While it can be difficult for a busy family like ours to coordinate a backcountry wilderness trip, for a family or individual with a disability, the obstacles may seem even more formidable: time, energy, know-how, the financial expense, compatible accommodations. 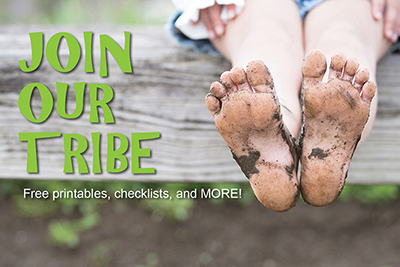 Wilderness Inquiry helps make outdoor adventures happen, regardless of the hurdle. 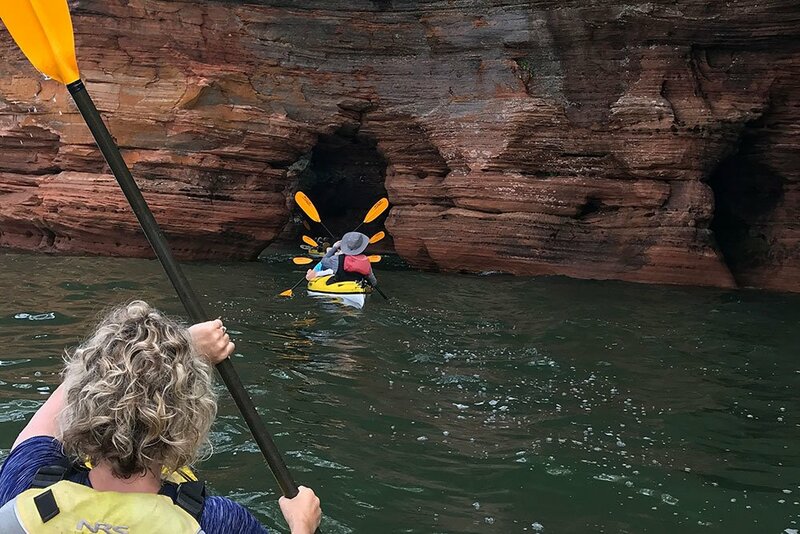 The Apostle Islands are WI’s only destination with its own base camp, sitting on 40 acres of pristine northern Wisconsin wilderness, a short walk from Little Sand Bay Beach on Lake Superior’s southern shore. The base camp can accommodate up to 90 people, and in addition to family camping, a variety of other themed trips are run out of the base camp. 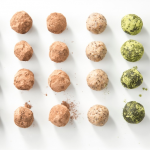 Interests – including cooking, yoga, and micro-brewed beer – are fused with kayaking and family camping. The family adventure campsite was wooded, and each of our four-person tents was set up on platforms at the time of our arrival. My husband, John; youngest son, Ryan; and I were greeted at the entrance by a camp host with a large cart. Then we simply wheeled up to the site, dropped off our backpacks, laid out our sleeping bags, and campsite preparations were complete. After introductions and a brief orientation, our group jumped right into the first adventure. Receiving kayaking instructions from our guides, we would be practicing something called a “wet exit” off the shore of Little Sand Bay Beach. The reason for this exercise is safety, and safety proved to be a priority. WI guides Callie, Hannah, Libby, and Tai instructed and modeled the technique, which involved flipping the kayak, releasing the spray skirt, and floating to the top of the water. Then, they stood on either side of the kayak as each group completed this precautionary exercise. Though competent instructors, the guides did much more than just teach us the basics to sea kayaking and water safety. At different times they functioned as bellhops, cooks, group facilitators, medics, historians, chauffeurs, and entertainers. Their presence was like a light summer blanket – comforting but never stifling. Our first official day out in the water, was as the melon-tinted sunset of the previous night predicted – bright, calm and clear. We caravanned to the Red Cliff casino and put in at their dock. After an hour or so of disembarking and receiving paddling instructions, we were on the water! 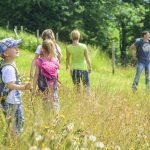 All of our excursions were geared towards families, each one lasting no more than three hours, and with a variety of ages and abilities in mind. This morning we were heading to view two shipwrecks. One, the 282-foot Fedora, was destroyed after a ship fire in September, 1901. As we kayaked next to it, we could clearly see its eerie skeleton resting on the lake’s sandy bottom, 10 feet below, near Buffalo Bay. Later, we floated above the hull of the Ottawa, some 20 feet below us at the northern edge of Red Cliff Bay. It too had suffered a fire, this time in November of 1909, after being called down from Ontario to help free another ship from an uncharted ridge on which it was stuck. As we paddled on, Libby warned us not to point if we saw a bald eagle, a habit the Red Cliff natives consider unlucky. Five minutes later, when one of the majestic birds flew overhead, we refrained from raising our arms. Perhaps the captains of the Fedora and Ottawa had failed to heed this advice. I would like to say that our first sea kayaking adventure was as perfect as the weather. Truthfully, it took my family a while to get into the groove. One thing I learned about sea kayaking – it requires rhythm. 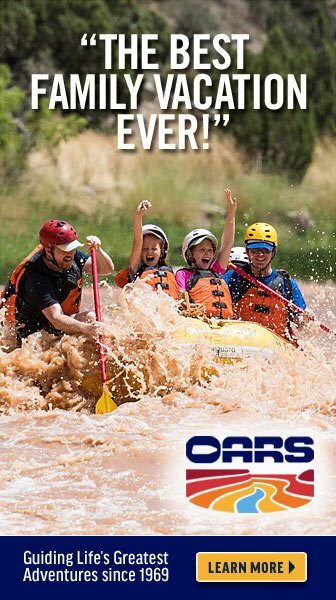 And if the three people in the kayak don’t get into the same rhythm, it’s more like a sword fight. I led the strokes by virtue of the fact that I sat in the bow and couldn’t see anyone behind me. Ryan, annoyed that I was paddling too slowly, decided to set his own pace, resulting in our paddles knocking against each other instead of evenly stroking the water. Ryan then quit paddling, which made my life easier, but frustrated John who was steering in the stern (the three-person Current Designs Libra kayaks have a rudder and foot paddles for steering). At times I disagreed with John’s steering choices, and, as I sometimes do in the car, became a backseat driver – from the front of our kayak. As we disembarked and packed up following the kayak trip, it became clear to me that the other families had their own “dynamics.” This included a mysterious arm injury rendering paddling in one kayak “impossible” and a mom in another kayak who did the majority of the paddling on her own while her children in front of her spent their time arguing. The first day of kayaking was a great example of “type 2 fun,” as Callie described it, something we could laugh about later, but not at all funny in the moment. Following a picnic lunch of sandwiches and fruit, families had a choice of exploring the town of Bayfield or hiking the Brownstone Trail. 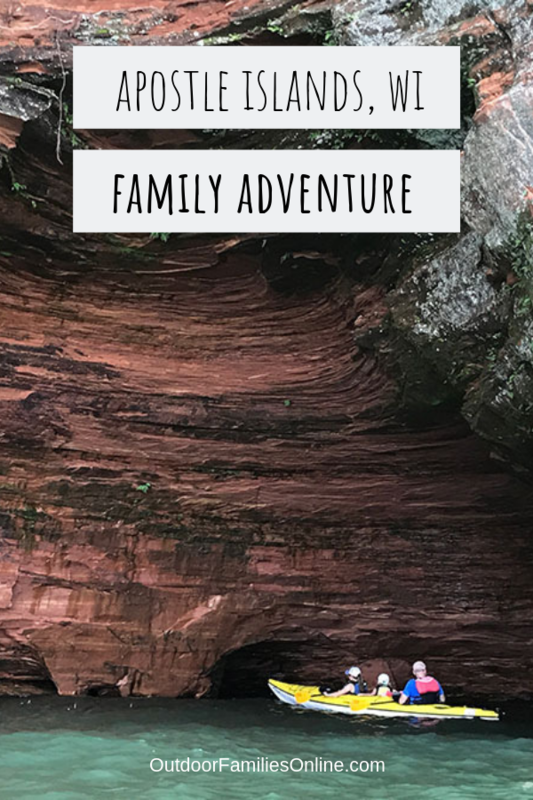 My family opted for the trail, a two-mile wooded hike that slowly rises up into the hills above Bayfield with picturesque views of the water, quaint bridges and wild raspberries that we munched along the way. Though not necessary for anyone in our group, the Brownstone Trail is the only wheelchair – accessible trail in the area. We ended our afternoon with a quick stop in town for ice cream at The Candy Shop, known for their homemade waffle and sugar cones. Upon returning to camp, the remainder of the afternoon was open. I have camped in areas that don’t include bathroom or shower facilities, but this is not the case at WI’s base camp, and I was glad for it because I was ready for a shower upon my return. The outdoor showers are centrally located, clean, spacious and, most importantly, warm. The bathrooms, state-of-the-art composting toilets, are the cleanest, roomiest and best lit camp bathrooms I have seen. You can actually stand up and turn around. In fact, these facilities are but one example of the cleanliness and attention to detail WI has taken in the design and management of their base camp. All facilities are wheelchair accessible. One of WI’s goals is to foster positive group interaction and connectedness. Still early in the trip, the family units had remained somewhat independent as we slowly got to know each other. The 10 kids in the group had not yet gelled, but after a dinner of grilled burgers and brats that night, somebody brought out a football and everything changed with a snap of the fingers. While the kids wore themselves out playing, John and I sat and talked with a couple from New Jersey. She and I had both lost our mothers recently. The four of us connected over aging parents and raising boys. By the time we sat down in front of the campfire for s’mores, we felt like old friends. Over a cup of coffee the next morning, I sat with another parent, Emily, at our picnic table while Callie, Libby, Hannah, and Tai prepared breakfast, on this morning oatmeal with lots of fixings, fresh fruit, coffee, tea, and hot cocoa. We talked about the kayaking experience with our kids the previous day. Emily fondly remembered attending ski camps as a child. “Struggle is where the best memories are made,” she recalled someone once telling her. And with that inspiring thought in mind, we took to the water once again. This time we put the kayaks in at Meyers Beach along the National Apostles Island Lakeshore, which required us to carry the kayaks and other equipment down 40 steps to the beach. Each step was worth it. Today we would see the legendary Meyers Sea Caves. The caves evolve with every season, Hannah told us, the sandstone soft and vulnerable to erosion. Each summer when the kayakers return, they discover that a few might have disappeared while new ones took their place. It took us about 45 minutes to paddle to the caves. The first one we entered was wide and enclosed. 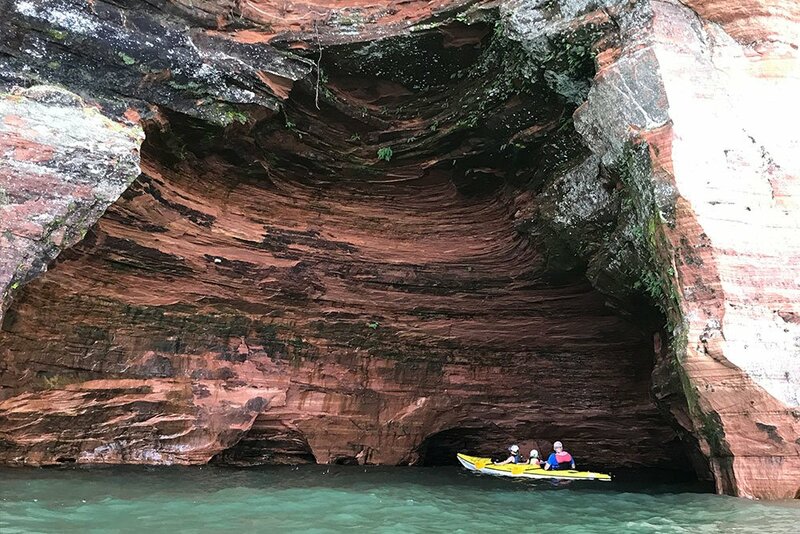 Only one kayak could enter at a time, passengers staring up at the sandstone ceiling, catching drips of water on their noses and listening to the reverberating crashes of the waves against the walls. Other caves were narrow, just wide enough for not much more than a kayak but high enough for its passenger, the underside of the redstone bridge tickling our hair as we drifted through. Exiting one of the caves and staring up, I noted the exposed roots of the trees reaching over the edge of the cliffs, 30 feet above. Almost as satisfying as the landscape, cooperation in the kayaks emerged as struggles of the previous day became a memory. My family had found its rhythm, and this time Ryan worked energetically, as he most typically does. I noticed that with some rearranging in the kayaks, other families had settled into a comfortable rhythm too. 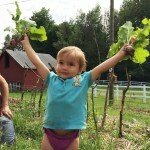 This is what we do as parents – introduce those things we want our kids to experience and wait for them to acclimate and come along with us. Lunch in the park included pitas, hummus, tabbouleh and fruit, then it was off to Lost Creek Falls. A perfect afternoon hike for families, this one was 1.5 miles round trip, through the gentle slopes of a wooded area. The trail led us to the eight-foot falls where we stood in the cool, watching the water dumping off of the familiar red ridges of rock and then flowing down a stream where it formed a perfect pool. Ten-year-old Scout, one of the children in our group, jumped right in the pool, came up shivering and then did it all over again. Several of the boys, along with a guide, wandered down the creek, skipping stones, searching for critters, and creating towers from stacked river rocks. Our kayaking expeditions had ended the previous day, and a few of the families needed to begin their drive home early. For those of us who remained, we still had a delicious breakfast of blueberry pancakes and a phenomenal hike remaining. As usual the meal was fresh and delicious, and included alternatives for anyone with dietary restrictions, including my husband, who is on a gluten-free diet. Our final hike was a 1.5 mile jaunt along the Houghton Falls Trail. It transported us into a mystical ravine and down a sun-dappled path through birch, pines and maples, suddenly emerging at the edge of a cliff to a burst of blue, an intense meeting of sky and waves. We lingered on the sunshine-warmed outcropping of rock before bidding adieu to Lake Superior and our fellow family campers. Wilderness Inquiry’s Apostle Islands Base Camp: The design of the base camp in the Apostle Islands includes extra-long picnic tables that accommodate wheelchairs, ramps in front of a number of the platforms that the tents sit on, and extra large tent openings which make the tents wheelchair accessible. The kayaks are unique as well. 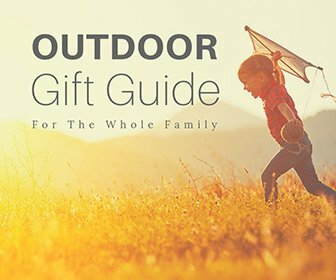 Specially designed for Wilderness Inquiry by Current Designs in Winona, MN, the middle compartment is enlarged for someone who needs additional space for their legs, or for an additional assistant such as a sign language interpreter or a service dog. Adaptive paddles are provided when necessary, too. If you go: The Apostle Islands are within driving distance of Minneapolis-St. Paul, Milwaukee, Madison, and Chicago. 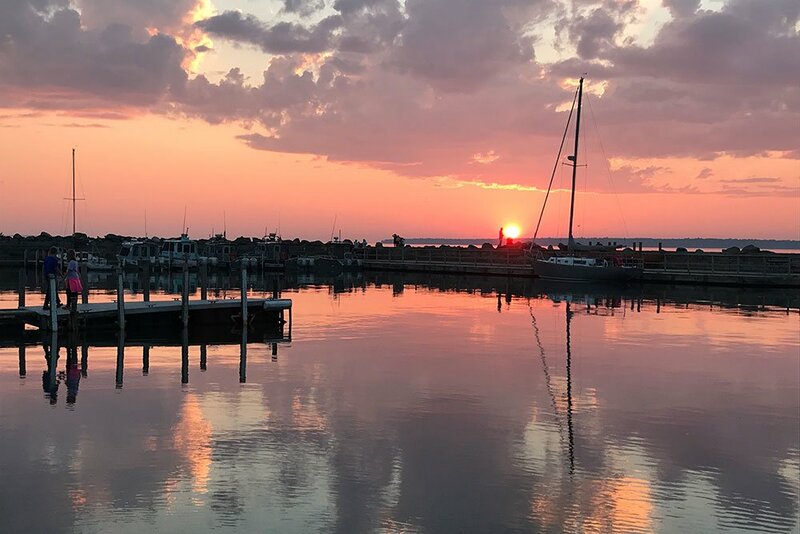 Bayfield, Wisconsin is the jumping off point for an adventure in this 22-island archipelago. 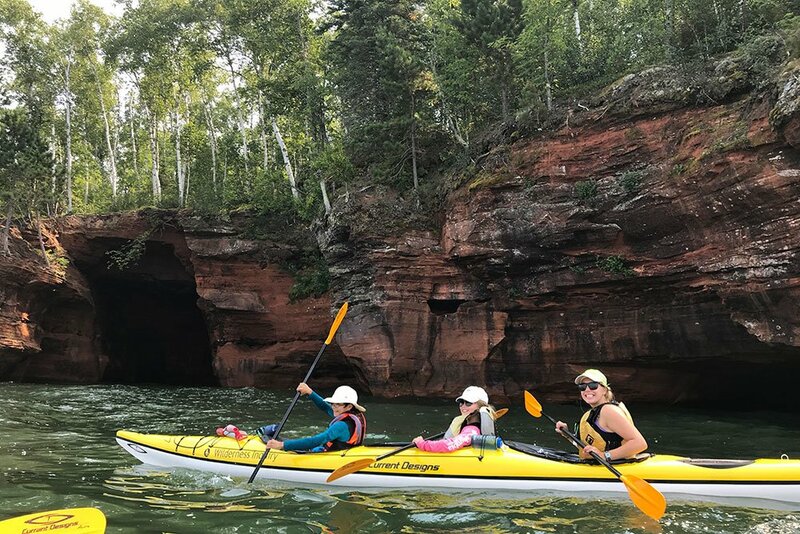 For more information on the Apostle Island trip options offered by Wilderness Inquiry, visit their website. 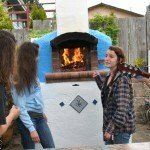 About Wilderness Inquiry: Wilderness Inquiry’s mission is to connect people from all walks of life to the natural world through shared outdoor adventures. 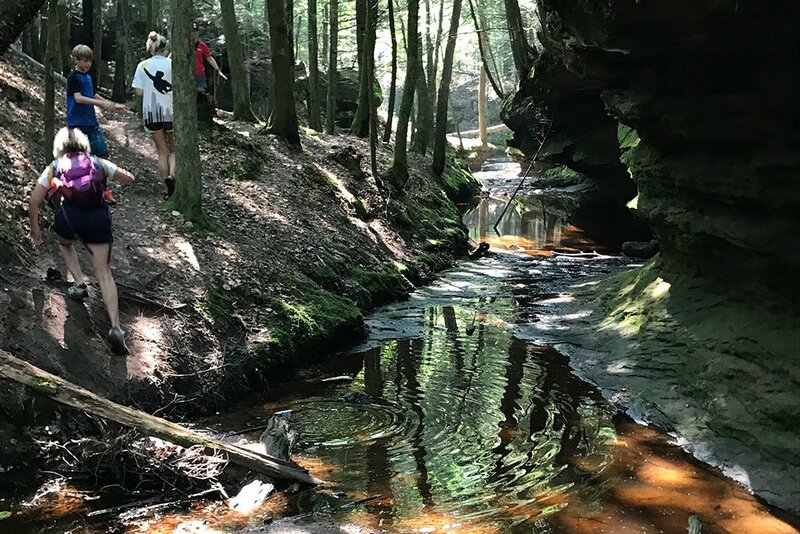 From a hiking trip in a national park to a safari in East Africa, WI has been planning and leading domestic and international adventures for forty years as well as providing supported programs for underserved youth and families and people with disabilities. 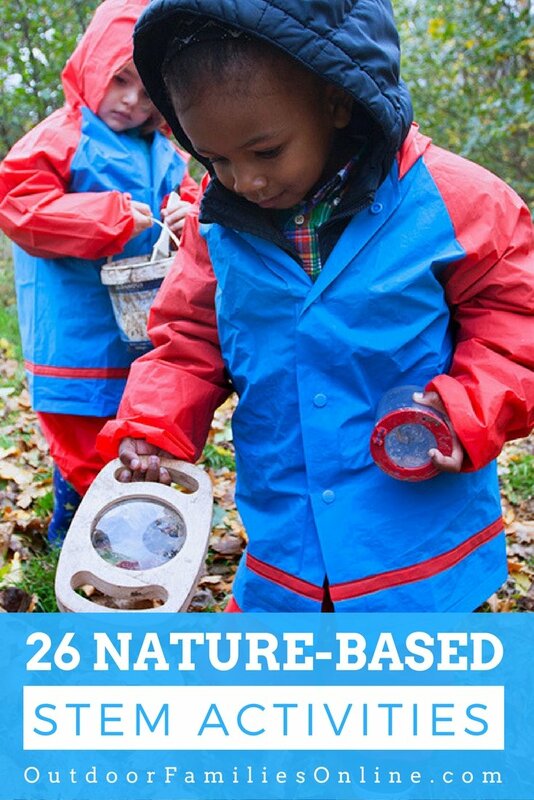 To learn more, explore WildernessInquiry.org. 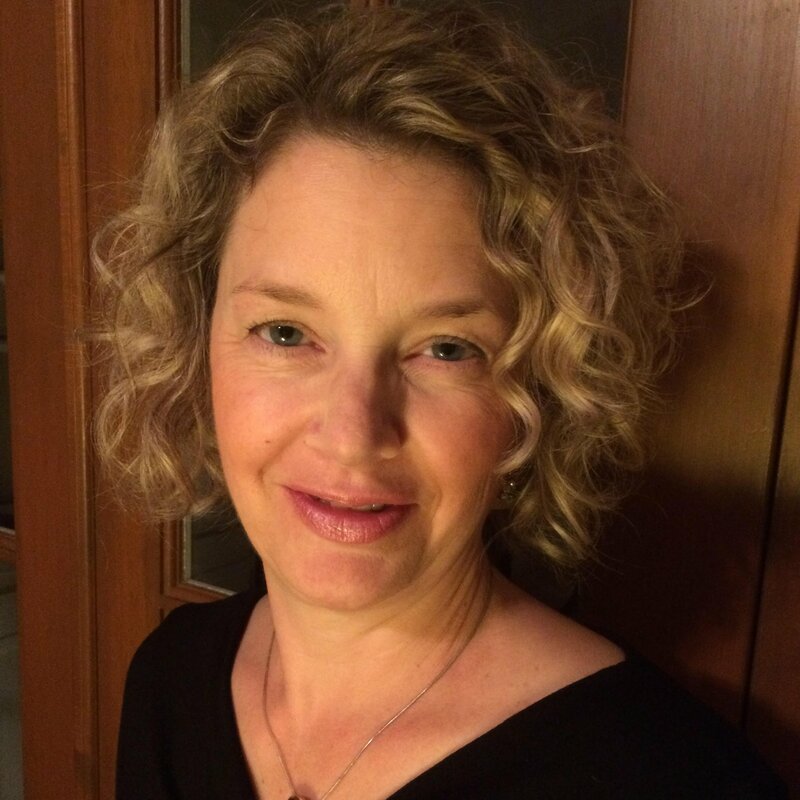 Jenny Wisniewski is a freelance writer from Wauwatosa, WI. 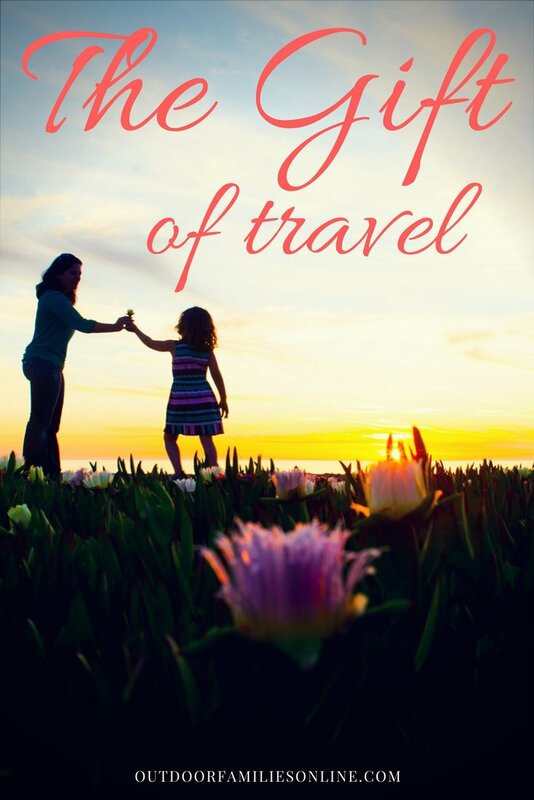 When not writing, you can find her practicing yoga, reading a good book, or exploring new places with her husband and two sons. You can find more of her writing at jennywisniewski.com or LinkedIn.